Today at Mobile World Congress, we are excited to unveil a new release of the Brightcove App Cloud content app platform. App Cloud enables digital media and digital marketing organizations to build and operate growing portfolios of cross-platform native apps for Apple iOS and Google Android smartphones and tablets. The new release adds new cloud services for intelligent cross-platform push messaging and content-level analytics that are intended to enable app owners to more easily engage their installed base, track campaign effectiveness, and identify their most impactful content. With more than 1 million apps available across the iOS and Android app stores, digital media companies and digital marketers increasingly struggle to acquire and retain a loyal audience. Keeping users engaged with a continuous flow of relevant content is more important than ever, which is why push messaging is a powerful tool for making users aware of new content. 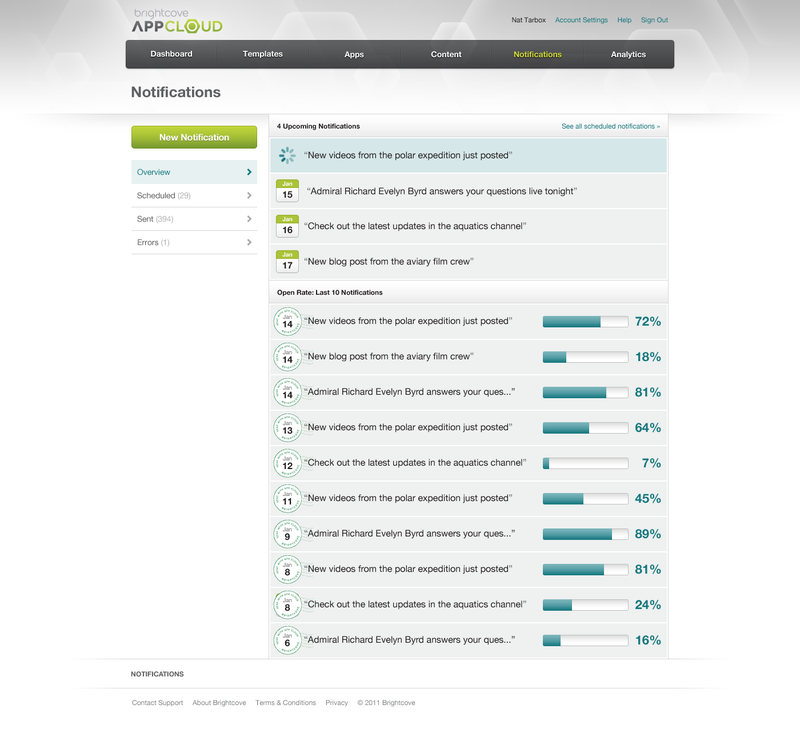 The latest release of App Cloud offers intelligent push messaging that is designed to allow marketers to schedule and send push message campaigns to their installed base of app users across both the iOS and Android platforms from a single dashboard, along with integrated analytics to deliver real-time feedback on campaign effectiveness. 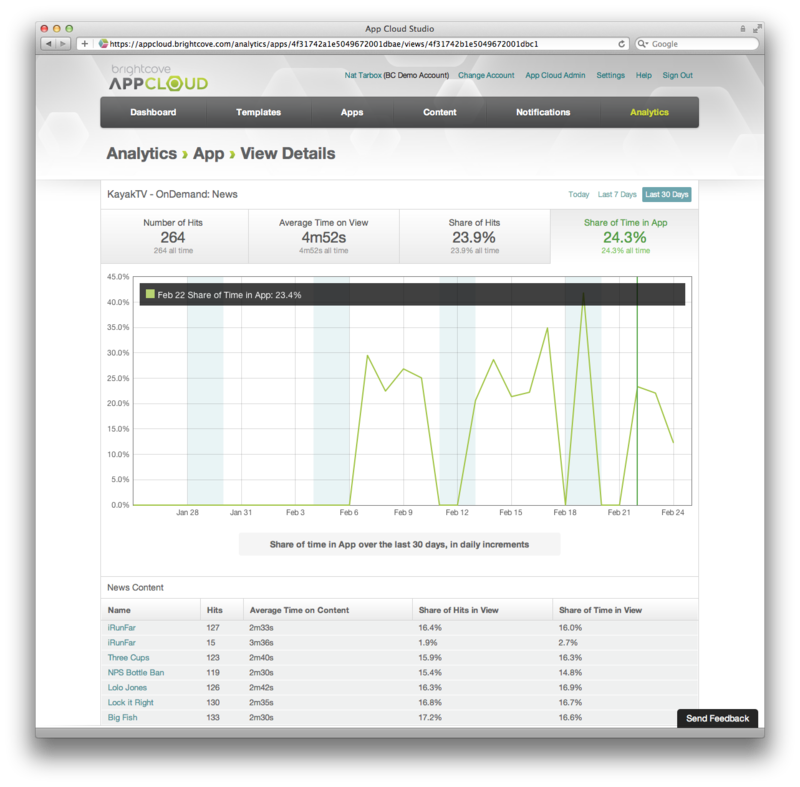 Additionally, App Cloud's expanded analytics introduced today are designed to allow app owners to track user activity at the content item level, enabling producers and marketers to see how many users have watched a particular video, viewed a specific image, or read a specific article or blog post. Combined with existing capabilities for tracking user activity at the section level, content item level analytics provider powerful insight into where users are spending their time and attention. The expanded analytics capabilities in App Cloud are available to customers today, and intelligent push messaging will be available in March. Brightcove will be demonstrating the power of App Cloud live this week Mobile World Congress in Barcelona. Brightcove will be located in the App Planet exhibition zone at the event in booth 7G8. If you are interested in learning more about content app platforms, check out our new Bright Ideas video with Brightcove CMO, Jeff Whatcott, and vice president of technology, Ashley Streb. To learn more about App Cloud and to sign up for a free account, visit www.brightcove.com.